In the first decade of the twenty-first century, the fashion world was dominated by two very different but equally successful and turbulent figures. But, within twelve months, Alexander McQueen had committed suicide, and John Galliano has professionally imploded. Who was to blame? And how was fashion changed by their rise and fall? 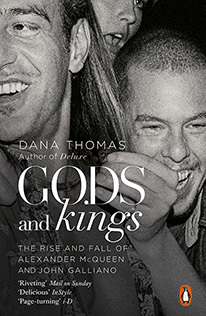 This is the story of Galliano and McQueen, the two working class British boys who shook fashion to its core. With their complicated and deeply seductive designs, they moved from the raucous art and club scene of London to the old-school heart of French couture. Dana Thomas, who witnessed their arrival in Paris and who interviewed more than one hundred people close to both designers, presents their lives in rich detail. Highlighting the similarities and differences in their temperament, charisma and style, she explores both their individual talent and the changing nature of fashion over the 80s, 90s and noughties. The result is a deeply engrossing, fast-paced and original read. Galliano and McQueen weren't simply driven and gifted: they wanted to revolutionize fashion in a way no one had in decades. And for a while, they succeeded.